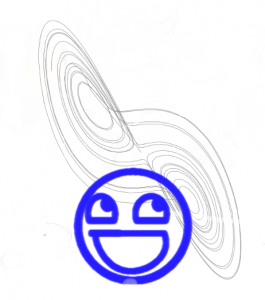 First, I had the program draw a Lorenz attractor, and then reproduce a small graphic of a the “Awesome-Smiley”. Some of the technical hurdles that I faced included figuring out how to hook the mouse cursor at a low level, both to send it movement and click instructions in addition to figuring out what its position and button states were, multithreading the application, and manipulating raster images in various ways (scaling, thresholding, etc). I had programmed similar functionality into the older Java version of this program, but lots of little things were different. I have yet to touch some of the more interesting features of the C# language. You can use lambda functions with it, which I imagine will make a few types of programs much easier to code. Memory access is another topic I should also explore in the future. Perhaps I will make a memory scanner that finds certain specific values in memory… (Cheat Engine, anyone?) Or perhaps I could program something for the XBox 360. Anyone want to buy me one? 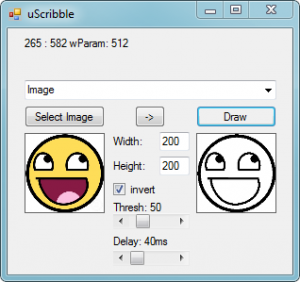 This entry was posted in Art, C#, Programming. Bookmark the permalink. Post a comment or leave a trackback: Trackback URL. This is jeaniousse. Tell me, squire, what do you believe are the moral implications of releasing such a… deadly tool, to the masses? Hmm?